3 out of 4 stars. I'd recommend it. There are a million to pick from and I don't know that any others would be much better. This was a Christmas gift. Thanks! For the sake of the review, it looks like they go for just over $20. 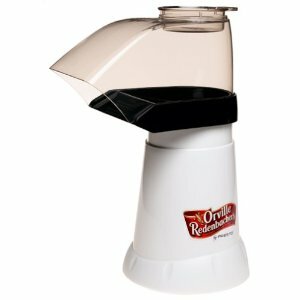 The Orvill Redenbacher's Hot Air Popper by Presto is small, easy to clean, easy to use and pumps out a bowl of popcorn in about two minutes. It drew about 11.7 amps during our test pop. It claims "Virtually no unpoped kernels", but there are quite a few more than "virtually none". Most of them come out right at the start. Once it gets popping enough to fill the neck of the popper I think it keeps the rest from flying out too soon. Just as a note, we were using brand new Orvill Redenbacher's popcorn kernels. I haven't popped a full 1/2 cup of kernels yet, just 1/4 cup. It could be that there wouldn't be many more in a batch twice as big as what I popped. I'd say it still does a pretty good job of popping. Some kernels tend to fly out too soon. I don't remember this happening with the Popcorn Pumper we had growing up.